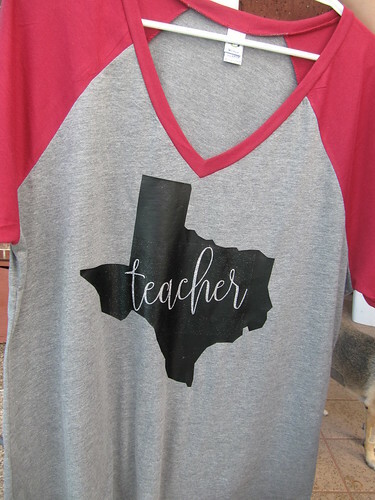 I have wanted a Texas Teacher shirt for a while but never seemed to get around to making myself one. I found this very soft baseball style shirt that is lightweight and short sleeved. 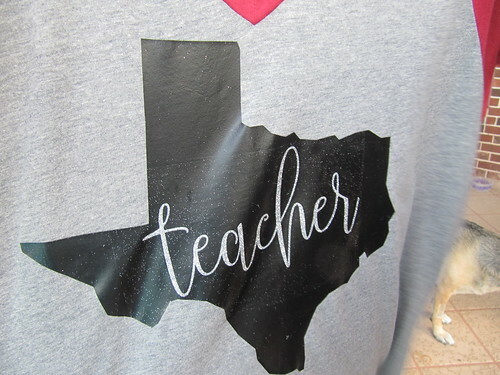 I knew it would be perfect for starting the school year. It is still so hot at the beginning of the year I don't want 3/4 sleeves or anything too heavy. I used SCAL to create the cut file and my Scan N Cut to cut the vinyl. I convinced my husband I needed a heat press last fall so this shirt was a snap to finish up (don't mind my photo-bombing dog in the background).